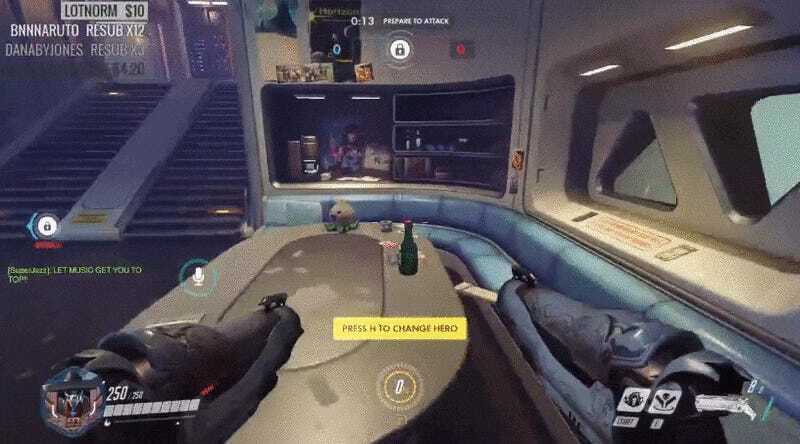 At the start of some Overwatch levels, you can find basketballs aboard the Overwatch crew’s trademark sky limo. They’re fully physics-enabled, so you can blast them to your heart’s content. Recently, Blizzard changed them—for the worse, imo. Woo! You did it! Your mom, dad, the President, and Freddie Mercury agree that you are a champion. Seriously, though, this is a smart addition to Overwatch’s basketball meta. Previously, it was sometimes hard to tell if a shot went in or not. Now, it’s clear as fireworks in a Fourth of July night sky. Unfortunately, Blizzard also tweaked basketball physics. Suddenly, it’s like taking half-court shots inside a bounce house. Even melee attacks make basketballs soar. If you smack one while it’s still bouncing, prepare to watch it hurdle around the whole dang room for multiple seconds. Wanna start a match with a morale-boosting shot? Wanna inspire confidence in your leadership skills because, damn, lady/dude can ball? Wanna use Pharah’s jetpack to pull off the dunk of the century, immediately ending the match and beginning the apocalypse as seen in Barkley, Shut Up and Jam: Gaiden? Too bad. You probably can’t. Overwatch is barely even playable anymore. Game director Jeff Kaplan says big basketball changes are incoming. For now, all we can do is pray.